In this tutorial, you will learn how to launch a JPEGmini Server running on the Amazon Web Services (AWS) cloud infrastructure in 5 simple steps. 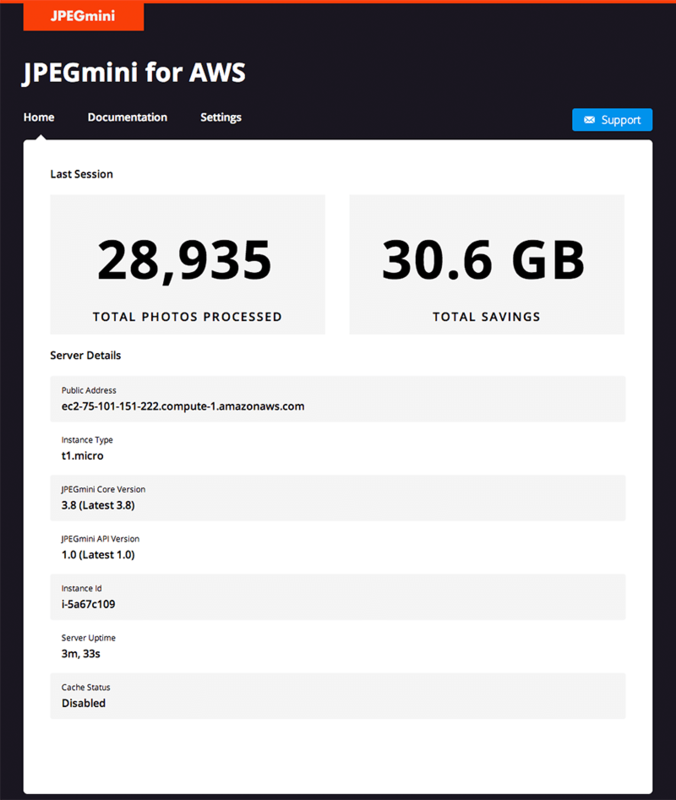 This tutorial covers all the steps required for creating and launching a JPEGmini server instance on AWS, and optimizing photos stored on your computer. If you already have an AWS account, skip to the next step. 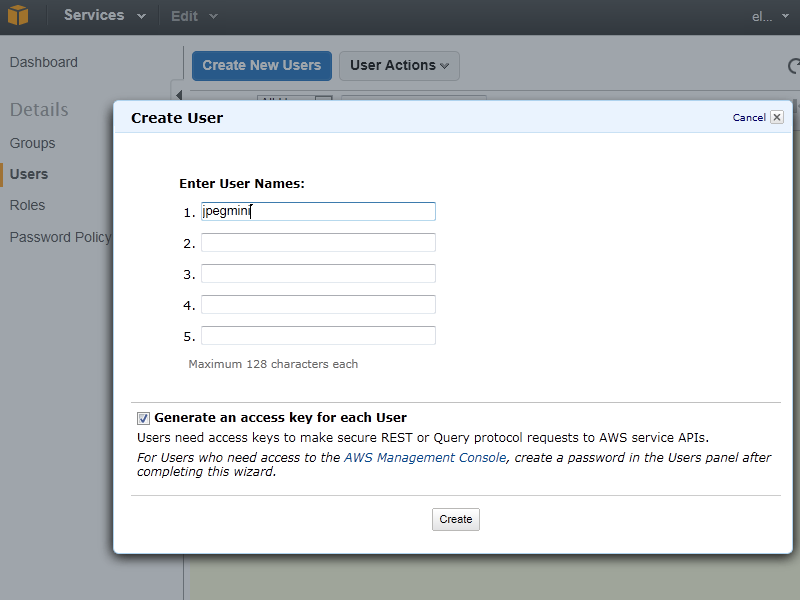 If you don't already have an AWS account, use the following procedure to create one. Note that when you create an AWS account, AWS automatically signs up the account for all AWS services, including Amazon EC2. However, you will only be charged for the services that you actually use. 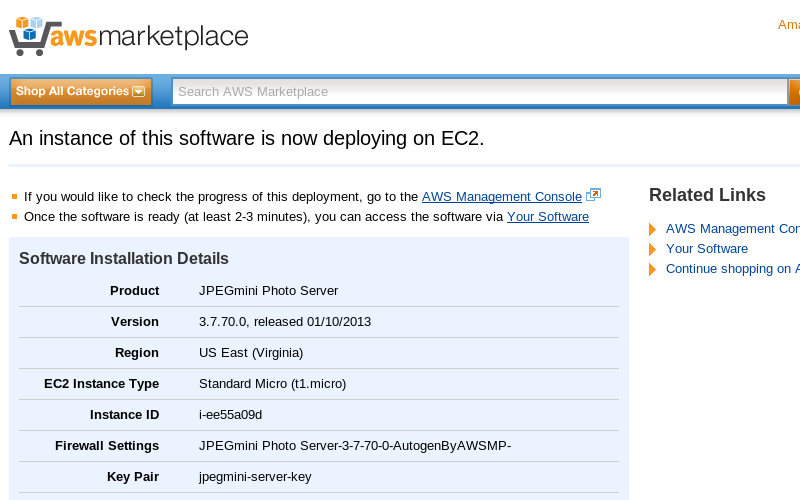 The JPEGmini Server is available on the AWS Marketplace as a pre-configured Amazon Machine Image (AMI). 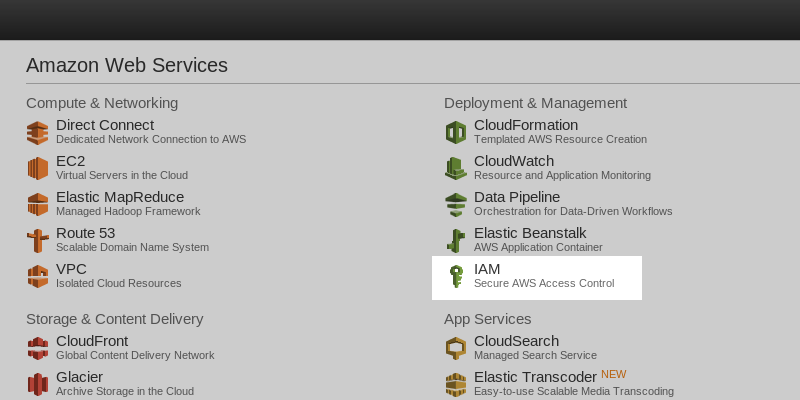 To launch your server, go to the JPEGmini Server for AWS page. Make sure you are logged in with your AWS account. Click on the “Continue” button to proceed to the launch page. 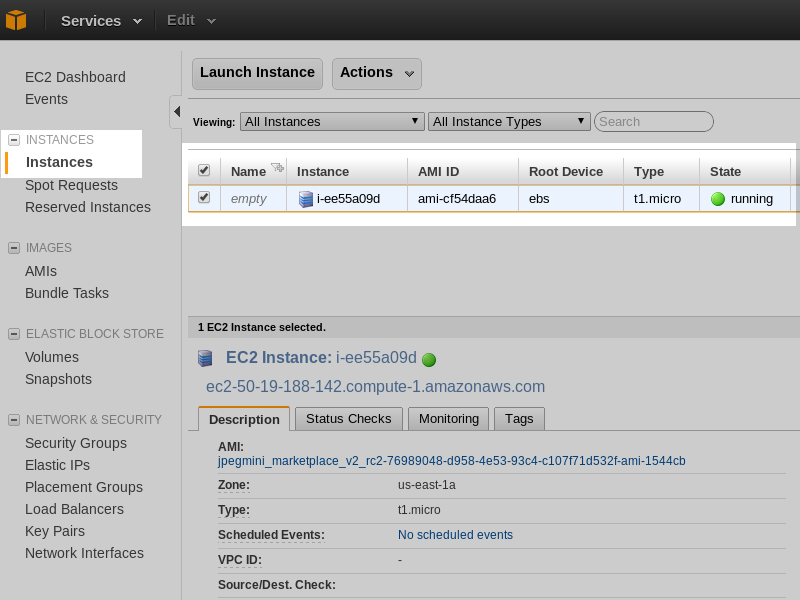 Before launching the JPEGmini Server, you will need to select an EC2 Instance Type. In this tutorial we will use the Standard Small (m1.small) instance. If this is your first time running an EC2 instance, you will need to create a Key Pair. The Key Pair is used to authenticate you when logging on to the EC2 server. If you already have a key-pair, select it in the key-pair section of the form, and skip to the next step. In a separate browser tab, open the EC2 Console and switch to the Key Pairs tab. 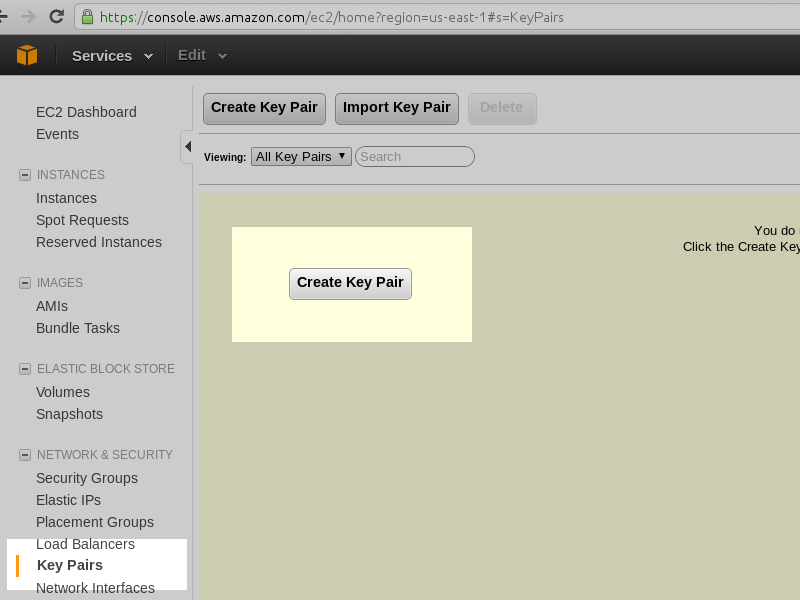 Click on “Create Key Pair”, set the name to “jpegmini-server-key”, and click “Create”. Your browser will download the private keyfile named jpegmini-server-key.pem, and a key-pair will show up in the ec2 web-console. Now go back to the Marketplace browser tab, and refresh the page. Make sure your jpegmini-server-key is selected in the Key Pair section. Launch the server by clicking “Accept Terms & Launch with 1-Click” It may take a few minutes for the server to launch - make sure not to leave the page until it launches. If you get a dialog indicating that the subscription is taking longer than expected, don’t worry. You will probably receive a confirmation email within a few minutes. 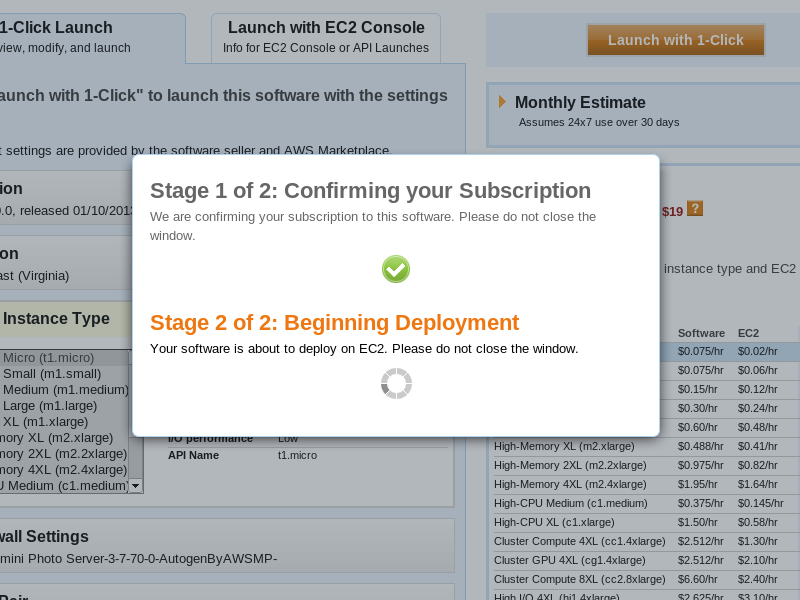 After receiving the confirmation email, go back to the JPEGmini Server for AWS page, and click on “Launch with 1-Click”. This time it should deploy faster, since you are already subscribed to the JPEGmini Server. If all went well, you should see a page indicating that JPEGmini Server is now deploying on EC2. Go the AWS console instances tab, select your instance, and copy the instance’s Public DNS to your clipboard. Connect to the JPEGmini Server instance with the following command. When connecting for the first time, your computer will alert that the authenticity of the host cannot be established, and ask you if you want to continue connecting - just answer Yes. The above command ran the JPEGmini Server and compressed the photo in the folder “Demo1”. The console output shows that the file size of the photo was reduced by 73%. Note the smaller file size of hipnshoot_mini.jpg, which is the result of the optimization. To quickly check that the server is online and active, browse to the following URL: http://your-public-dns-name/api/v1/heartbeat This method returns the current time and jpegmini version in json format. 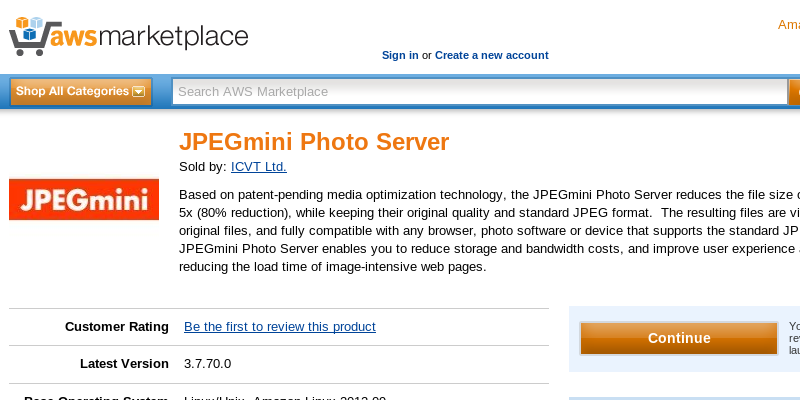 In order to optimize your photos, you need to transfer them to the running instance of the JPEGmini sever on AWS. The best method to do so depends on the location of your photos (stored on s3, stored on ebs volumes, on premise, etc.). In this tutorial we will use the free FileZilla SFTP Client to copy files from your computer to the server or from the server to your computer. 1. Download and install FileZilla to your computer. After clicking “Quickconnect”, FileZilla will show a dialog indicating the host could not be authenticated. Click “OK”. Once connected you will see the server’s filesystem on the right side of the window, and your local computer's file system on the left side of the window. You can copy files from one side to another by dragging them. 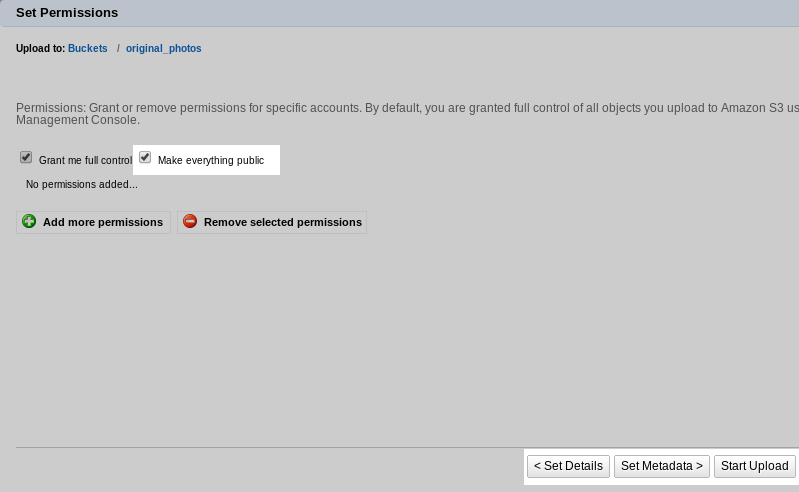 In the middle-right window, right click on the ec2-user directory, select “Create directory” and create a new directory called photos. Click on photos to select it, and note the bottom right window indicating it is empty. Copy over a couple of JPEG photos from your computer to the photos folder by dragging them onto the photos folder. On Mac computers, you can drag photos directly from within the Finder or iPhoto. On Windows, you can drag them directly from within the File Explorer. Wait for the photos to upload, and make sure you can see them inside the photos directory on the server’s filesystem (right side). You are now ready to optimize the photos you have uploaded in Step 4. Switch back to the Terminal window used in Step 3, use the ls command to list the files and folders, and make sure you see the photos directory you created in Step 4. Right click on the files with _mini suffix in the right window, and select Download. After downloading is completed, the optimized photos will be on your desktop. If you made it here, you have successfully optimized your photos. To save $$$, don’t forget to stop or terminate your instance when you are not using it. In this case, all files in the folder User/TestImages will be processed by JPEGmini. -lvl: Specifies the level of log information that JPEGmini will print to the console or to the specified log file (in case the -logfile=<file name> command line option was used). -lvl=1: Basic log level [default]. -csvfile=<file name>: Specifies the destination file for writing a summary of processing results in CSV format. The processing summary file is written in addition to the log information output. -rsz: Resize the image before recompression. -qual: Specifies the quality of the output JPEG image. -qual=0: Best Quality [default]. Produces an output image that is perceptually identical to the input image. -qual=1: High Quality. Produces an image with a higher compression ratio than “Best Quality”, which still has a high quality, and provides a good tradeoff between quality and file size. -shc: Specifies whether to skip highly compressed images. When this flag is turned on, the application analyzes the input image to determine if it has already undergone heavy compression. If this is the case, the input file will be copied to the output without applying JPEGmini processing. The purpose of this option is to prevent the overhead of processing input files for which JPEGmini cannot provide a significant additional compression gain. -rmt: Specifies whether to remove metadata from the JPEG image. Removing metadata deletes the auxiliary information associated with the JPEG image, such as date, location, camera model, etc. Removing metadata can further reduce the output file size, especially for small input files. Below is an example of a typical folder summary report displayed by JPEGmini. Pressing “Y” at this stage will cause the application to terminate. Pressing “N” at this stage will cancel the termination, and execution of JPEGmini will continue. 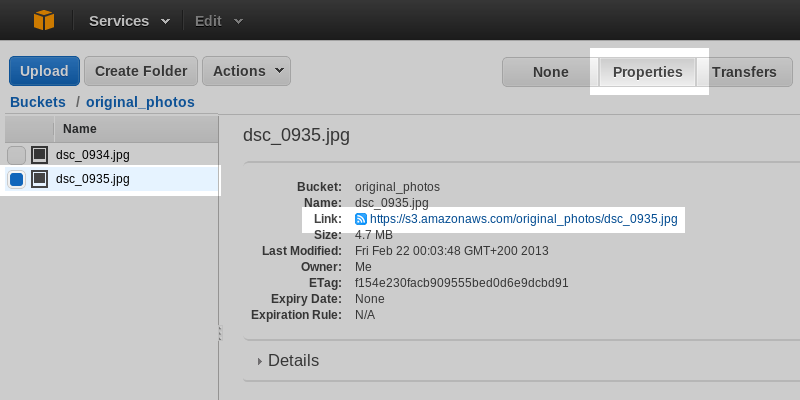 In this tutorial, you will learn how to copy photos from Amazon S3 to your JPEGmini Server running on AWS, optimize them, and copy the optimized photos back to S3. “Amazon S3 is the storage for the internet”, therefore a simple method of processing photos stored on s3 is extremely valuable. For more details about S3, see the S3 home page. Before accessing S3 from your running instance on AWS, you will need to setup the appropriate access credentials. AWS supports user-based access tokens, groups and roles. In this tutorial we will create a dedicated user for the JPEGmini Server instance, and grant that user full access to S3. Note that on a production environment, you would probably want more restrictive access for increased security. For additional information on access management, see the IAM documentation. 4. Click on “Download Credentials” to download a file containing the access id and secret access key for this new user. There are various tools to manage S3, create buckets, and transfer files between S3 and your computer (e.g. AWS Console, S3browser, etc). 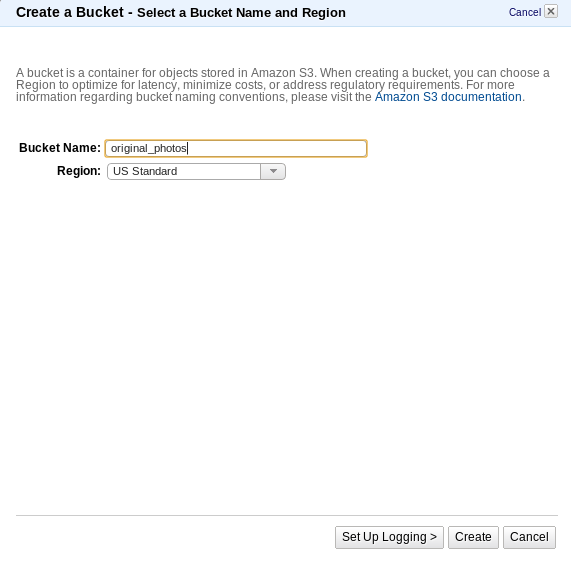 In this tutorial we use the AWS console to create a bucket and upload some files to it. 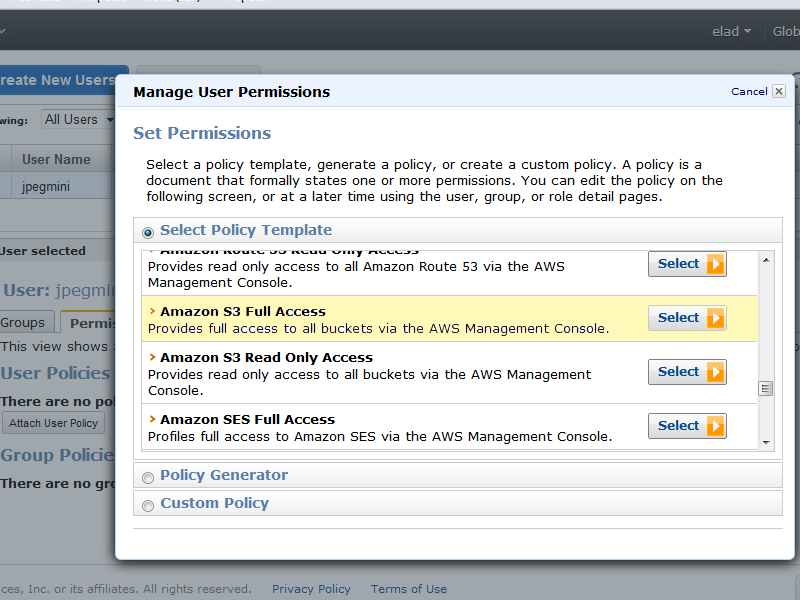 For additional information about S3, see the Amazon S3 documentation. Note the bucket names must be globally unique (i.e. two users cannot have the same bucket names). Repeat the three previous steps to create a second bucket with a different name to hold the optimized photos. By making the files public, you can view each photo directly from your browser. Get the file URL for one of the photos by right-clicking on it and selecting “Properties” from the context menu. The link to the file is shown on the right. In this tutorial we use s3cmd to copy files between S3 and the JPEGmini Server instance. s3cmd is pre-installed on the JPEGmini Server instance. It is a simple command line tool that can easily be automated (scripted) to manage all S3 file transfers. Copy the Access Key and Secret Key from the credentials.csv file which was downloaded in the previous step. Use the default answer for all other items, and when prompted to “Save Settings”, answer “Yes”. You should now see a list of your photo files, which are now located on the server. You should now see a list of files (your optimized photos). Note the files should have a _mini suffix in their filename, and their sizes should be smaller than the original files. The -P flag is used to make the files publicly available for download. Go back to the S3 Console to verify that the optimized photos have been placed in the bucket. JPEGmini REST API provides methods to optimize jpeg images. The table below provides information about the exit codes of the JPEGmini Server. The benchmarks below provide typical performance figures for the JPEGmini Server. * Performance may vary depending on system configuration and type of images.